Is it just us, or does it seem like you have to register your kids for summer camp earlier and earlier every year? Still, it’s nothing to wait on: you need time for yourself this summer just as much as your kids need time to explore the world on their own. A casual observer dropping into one of our classes might see young people acting out the lives and situations of student-generated characters, rapping and performing poetry and song, walking down Ninth Street in Durham and “listening in on” and recording conversations to develop an ear for dialogue, participating in a round-table discussion of their classmates’ work, taste-testing desserts as a review of the fare at the Mad Hatter Bakeshop and Café. Field trips to local businesses, art museums, gardens, and dance festivals are a regular feature of our classes. While campers are given class time for quiet writing, they also draft, revise, and edit collaboratively. After an academic day of writing classes, many of our extended day and residential campers choose physical afternoon activities such as sports and drama. UNC-Asheville’s summer writing program returns this year with week-long sessions in June and July for rising 6th-8th graders (“All Things Writing”) and rising 9th-12th graders (“Write Now”). The programs offer each participating student experience in different aspects of writing under the tutelage of Asheville’s finest writing instructors. Students will also participate in workshops featuring guest speakers who will address special writing-related topics. For grades 6-12: “All Things Poetry” (Eric Steineger); “All Things Writing” (Delana Parker); Embody Your Artistry (Melody Henry); Writing from Memories (June only)(Peg Downes); Legends and Lore (July only) (NCWN regional rep Alli Marshall). For 9-12 grades: Poetry Exploration (Eric Steineger); Minding Our Own: A Deep Dive into Personal Writing (NCWN member Jennifer McGaha); Worldbuilding, (Jamie Ridenhour). 1,500 blank pages. 359 days of planning. 36 new activities. 15 writers. 6 days. 3 field trips. 2 guest speakers. 1 mission to become Great American Writers! Young writers will hone their skills and styles as they learn to take ideas and develop them into coherent stories, poems, arguments, speeches, and more. Young writers will enjoy camp and gain new strategies for creating and communicating. Working in groups, individually, and one-on-one with an instructor, students will begin to see how their ideas and words have a place in the world around them. Follow the GAWC on Facebook for the latest updates. Poetry, prose, dramatic writing, graphic novels. The NC State Young Writers Workshop is one of the oldest workshops for young writers in the nation and remains one of the most affordable options for academic programs. They offer generous financial aid packages as well. ​The Young Writers Workshop offers genre specific small-group workshop environments for children interested in developing their creative writing skills. Our teachers are especially good at working with young writers–nurturing and guiding their enthusiasm and talent by building on skills and craft. Student-to-teacher ratio is low — no more than 12 students per class — so that participants can receive the benefit of the instructor’s expertise and individual attention. Students are encouraged and invited to explore their own styles of writing in the workshops and beyond. During the two-week program, they read from their own writings, work in small groups and workshops, and receive one-on-one craft-based instruction in plot, character, action, dialogue, conflict, and more. YWW students are grouped by interests and age (older students together with older students, younger students with their age group, as well). Students will be enrolled in two classes. Classes are 60 minutes long with a 30 minute (bring-your-own) snack break in between. Young writers are supervised at all times. Campers will create 21st century texts using digital tools such as storyboarding, blogging, and movie-making during this two-week camp experience. In daily writing workshops, students will work with UNCG faculty, graduate students, NC teachers, and local authors. The camp introduces young writers to the writing process, unlocks strategies of professional writers, and supports development of variety of writing styles. All work will be published on our website. Advanced courses are offered during the afternoon sessions in specific kinds of writing, such as podcasting, spoken word, and/or screenwriting. 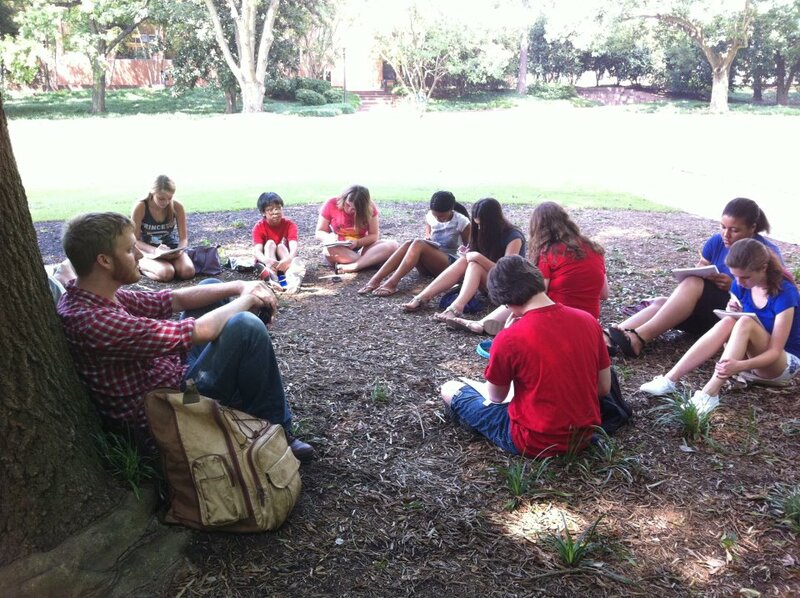 The Young Writers Workshop (YWW) is an annual five-day camp that brings together up to 45 high school students to study the craft of writing on the UNC Wilmington campus. The workshop is organized and operated by UNCW’s Department of Creative Writing, and camp participants have the opportunity to study with published, working writers-faculty members and graduate students in the department’s Master of Fine Arts in Creative Writing Program. The Young Writers Workshop provides a place for aspiring writers to experiment, meet other writers, and follow their creative interests in a safe, nonjudgmental environment. YWW participants take part in daily creative writing exercises, craft lectures, writing workshops, and readings. The week offers a valuable and exciting experience for young writers interested in learning more about their craft. Although YWW students are asked to submit a work of creative writing in one genre (poetry, fiction, or creative nonfiction), they receive instruction in all genres. Participants spend approximately six hours every day in writing exercises, peer workshops, and craft presentations. Students also have time to explore the UNCW campus, visit the bookstore and library, and get to know other young writers. This year’s Meredith College Young Writers’ Camp will take place from July 16-20, 2018. Our camp, taught by Meredith College English Department faculty, offers rising 6th, 7th, and 8th grade girls a chance to sharpen their creative writing skills, read and discuss exciting works of literature, and write their own fiction, drama, poetry, and essays. The Meredith College High School Writing Workshop open to boys and girls aged 14-18 (July 18-22) offers aspiring writers a chance to work with the Meredith College creative writing faculty, all of whom are published writers, in a small-group workshop setting. Instruction will focus on several genres, including fiction, personal essay, and poetry, and will include one-on-one feedback from instructors and peer workshop. Calling all writers, journal junkies, and graffiti enthusiasts! This Teen Camp experience combines creative writing and poetry performance with wild-style painting and collage. Join slam poets and mixed media painters on this journey through the power and possibilities of the spoken and visual word. Whether your teen has a blooming interest in poetry, rap lyrics, or bold fonts and graphics, this experimental five-day workshop will help them hone their skills in creative writing and design. Throughout the week, campers will work on a series of writing, journaling, and sketchbook exercises; practice speaking and presenting in front of small groups, and work collaboratively on one large mixed media painting. The group will also explore the wall poems and murals of Uptown Charlotte’s many parks and cultural spaces. The week will culminate in a group show and poetry slam performance at our studio space at Spirit Square. This was written by charles. Posted on Tuesday, March 27, 2018, at 10:21 am. Filed under Uncategorized. Tagged Duke University, ncsu, summer writing courses, unca, UNCG, uncw, writing camps for kids, youth writing camps. Bookmark the permalink. Follow comments here with the RSS feed. Both comments and trackbacks are currently closed.